Since the disaster my life has changed completely, and along with many others, I find it necessary to go back to Thailand, and I keep returning. Being there makes me feel close to those who I miss so much. When I was out there in February 2005 I was taken to see the TVC (Tsunami Volunteer Centre) which was then based in the hill side of Khoa Lak. I had originally returned with the British Embassy to give more personal details of my loved ones still missing, the stop at the TVC was not planned. We were shown around and told about the work that was being done; I was still too injured to give any help to others but in desperate need to do something constructive. I returned again with the Red Cross in December 2005 for the first anniversary, still not able to work at the TVC as I was based mainly in Bangkok. 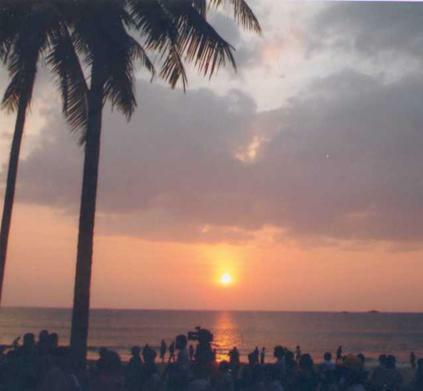 In December 2006 I returned again, but to Khoa Lak, I had arranged by email to spend my stay working with the TVC. Once there I just knew it was the right thing to be doing. I met some lovely, and truly wonderful people and volunteers, I had no reason to feel unwanted, lost or detached (the feelings I fight with through day to day life at home), the people at the TVC never gave me a chance to! I worked mainly in the Education side of things, every day visiting two schools; some were Thai and others Burmese. The joy this brought me is indescribable; I felt I was putting something back, helping a community that had helped me in my hour of need. The people were so accommodating and were always pleased to see you, the children even more so! In one of the schools I even got my own Thai lesson, a young girl around the age of 10 taught me some words in her language and she really made my day, priceless. One whole day was spend in a Thai school in Nam Kem, we ran a sort of summer camp where we had large groups of children in different activities, under the large hanger the heat was overwhelming but the joy of being there over rode the heat. The TVC organised a 2nd anniversary for the Tsunami and an exhibition was held to show tourists and the local community what work has been done and is still on going. My last few days were quite at ease and I managed to do a little manual work, sanding school benches down, by hand! The result when finished was rewarding (plus a few blisters). The Thai and Burmese children made me feel really humble, for once I was looking at others with so little in life, yet full of life! My worries were decreased in size, almost invisible. In the evenings I always had someone to eat with, mainly the volunteers and only twice did I eat alone, but the strange thing was, I never felt alone, I always felt Tom and his parents were near by, somehow watching over me. Some may find this hard to accept or take in, but this was making me feel so much closer to them, to the extent that I really didn't want to go home. Back at home is where I struggle to exist but in Thailand, Khoa Lak I felt alive. I plan to be back in Khoa Lak December 2007 and put myself to use where ever needed with the TVC.To have had the chance to work at the TVC has helped me find some reason to be here, some way to pay back my debt, the only thing it didn't do, was take the guilt of surviving away, it did for a while but not for long. Life goes on, and of course we have to follow, but it's up to you how to follow on,. I will spend every Christmas out there helping others, but when that ends I'm not sure what else I will do. The tsunami volunteer organisation has, after four years, ceased operating. There is still a website at http://www.tsunamivolunteer.net.